Bournemouth Borough Council: Pure Town Planning are pleased to announce a successful appeal win for the erection of boundary fencing for a residential property in Moordown, Bournemouth. Boundary fencing was erected on a property fronting Redhill Drive due to concerns about safety and security. Unfortunately being taller than 1m and alongside a highway planning permission was required and thus a retrospective planning application was submitted. 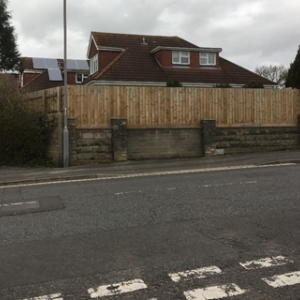 Bournemouth Borough Council considered the 1.5m high close boarded fence (set above a 1m brick boundary wall given the sloping gradient of the road), to be incongruous and detrimental to the area when viewed from the street. The application was refused on grounds that the unauthorised fencing would go against the common style of boundary treatment in the locality – creating a harmful ‘fortress effect’. An Enforcement Notice was issued for the removal of the boundary fencing. Pure Town Planning were approached to lodge an appeal against the notice to the Planning Inspectorate and challenge the Council’s decision. The Inspector’s appeal decision noted that whilst the fence was significantly taller than most frontage boundary treatments, being visible does not mean it is necessarily at odds with its surroundings. Furthermore, the decision confirmed that given that the dwelling itself remained in open sight from the street, the fencing would not create the ‘fortress effect’ as put forward by the Council. As the erected fence was considered to be fully acceptable, the Inspector allowed the appeal, quashed the enforcement notice and granted planning permission for the fencing to remain on site – being extremely welcome news to the applicant following a lengthy process dating back to September 2017. Whilst we would always instruct clients to seek professional advice before the commencement of works, if you do need assistance with retrospective planning permission or any form of planning appeal, please do not hesitate to contact us on 01202 585524 or email us at info@puretownplanning.co.uk for a full assessment.